The 2019 Songs of Hope™ concert tour will run from July 4 to July 28. 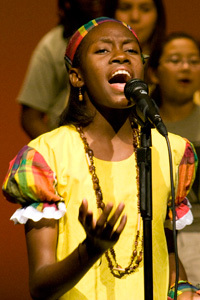 We are featuring talented young performers from 15 countries worldwide. And we have already started booking for 2019. Available dates don't stay open for long, so book early! To book a concert, please contact Jeanne Junge, artistic director, by email at [email protected], or telephone her at 651-225-4179. In addition to concerts for the general public, Songs of Hope performs many "arts-in-service" or AIS concerts at schools, nursing homes, summer youth programs, human services agencies, etc. Contact us if you would like information about booking or attending one of these special performances, which are typically 20-40 minutes long. We also offer percussion workshops and international learning activities for people of all ages. View the 2012 Songs of Hope Concert on YouTube here. All concerts below are the full 90-minute show open to the public unless noted otherwise. (AIS) means an arts-in-service concert for special audiences. Call us if you are interested in attending an AIS concert to learn if your attendance is permitted. For concert directions, call 651-225-4179 or email us at [email protected]. Or use the web links below.